This capable smart phone has two things going for it: it’s fast for a mid-range phone and it has a great display screen. Aside from those two big selling points, there’s not a whole lot to make the Samsung Galaxy W stand out when compared to the iPhone 4s, but it rings in at a lower price point and it has a slightly faster processor. This is a mid-range smart phone that isn’t an embarrassment – far from it, after all, it’s an upgrade of the Galaxy S. But this phone isn’t imbued with a big wow factor either. Just a sharp little phone that does what you want without all the bells-and-whistles that you’d expect from a new upgrade. It’s speedy given the price point but there is no SIRI personal assistant feature with great voice-activated commands or a re-configured notification system. The bottom line is that the Galaxy W is all about performance instead of fashion. That’s clear. This is a 3G phone that won’t disappoint you but surely won’t kill your iPhone envy. In fact, the Apple Geek in your life will still do laps around this phone if you let them because it is designed strictly as a piece of good hardware at an acceptable price. Your wallet will be lighter but you won’t have SIRI telling you about the weather. However, we do have to admit that the phone does boast good graphics. The 3.7-inch screen has WVGA resolution at 480×800 pixels, which looks impressive and adds to the gaming experience for sure. That’s a slightly bigger screen than the iPhone 4s and it’s got nice clarity to give Apple a run for its money. This is an Android phone running the latest OS – 2.3 Gingerbread. With access to those 250,000 Android Apps, there are plenty of cool games to play on this gorgeous screen. It also features an accelerometer, a pressure sensor and a proximity alarm. The rear facing camera is capable of shooting video and it has an LED flash but it is only 5 Megapixels, which is slightly disappointing given that most of the other phones have 8 megapixel snap shot capability and beyond. The 1.4 GHz processor with 512MB of RAM gets you nice response and solid web browsing. There is also a 2 megapixel front-facing camera for video chat. It boasts up to 7 hours of talk time on one charge and 440 hours on stand-by. It shares similar dimensions to the HTC Desire S as far as size and look. It also features a microSD card reader for memory expansion, and comes unlocked with Wi-Fi and Bluetooth capability. It includes FM radio reception, a GPS and 4GB of internal storage which you can expand with additional memory up to 32 GB. It is available in the UK on Three. 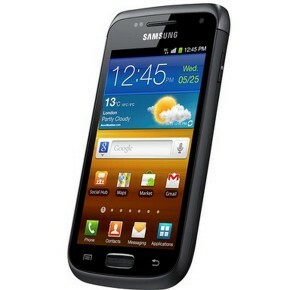 When is the Samsung Galaxy Ace Plus coming to the UK?